In order to provide first time clients with one on one attention, we recommend a private introductory session. This allows our experienced instructors to asses your health history, body alignment and provide insight into your body's particular needs and how to address them. One on one sessions allow you to receive individualized instruction to meet your specific needs. Private sessions are ideal for anyone seeking in-depth instruction in the Pilates Method, and especially for anyone with special considerations (recovery from injury or surgery, pre- and post-natal, or other chronic issues). They can also be scheduled periodically to review exercises learned in group classes that need more instruction or assistance. We offer semi-private sessions for groups of two or three people. This option allows you to work in a small, more private setting while receiving increased hands-on attention from the instructor. This option is also great for pairs and trios who need scheduling flexibility, as the sessions are booked by appointment. 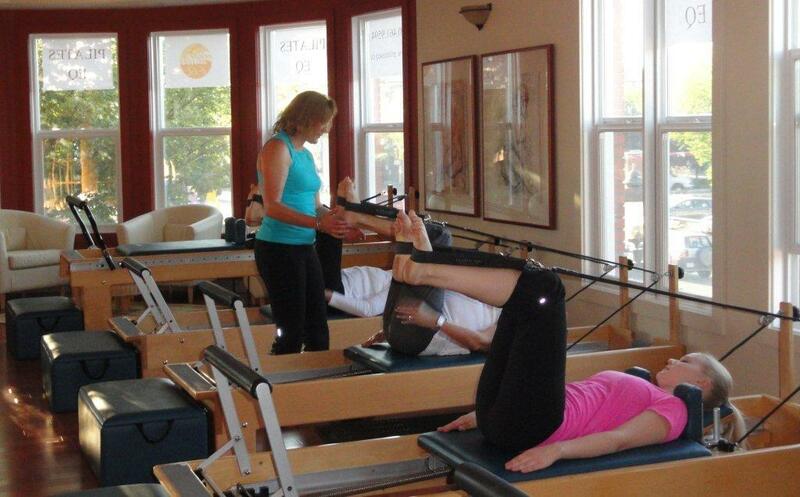 Our group classes consist of various Pilates mat classes, specialty classes and equipment classes. We run our group classes in 4 separate sessions a year (10-14 weeks ea). Registration is normally for the full session but beginner classes are sometimes started mid session depending on demand. Individual classes can also be purchased. Personalized attention to our clients is a priority in all of our classes. Our group mat classes are capped at 12 participants and our equipment classes are capped at 6. With more than 25 classes offered per week, there is something for everyone regardless of age or skill level. Whether you are a teenager, a new mom or an elite athlete, we have a class for you. We also suggest scheduling occasional privates in addition to your classes so that you can improve your practice with some individual instruction. We provide clients with the option to participate in self-led sessions after completing a personalized program of five or more private sessions. There are between two to six clients working out with a fully certified Pilates instructor who provides feedback when needed. This non-competitive environment allows you to work at your own pace and achieve your specific goals. We recommend 2–3 sessions weekly for optimal benefits. When it’s time to update your program, we recommend supplementary private sessions.